The 'Ambridge Rose' (David Austin. 1990) is an old-fashioned rose borne on an attractive bush, about one metre tall. It has beautiful soft, apricot pink, fragrant flowers that bloom Repeatedly. This is one of two ('Fair Bianca' is the other) of Oprah's favourite roses for her bedside table. 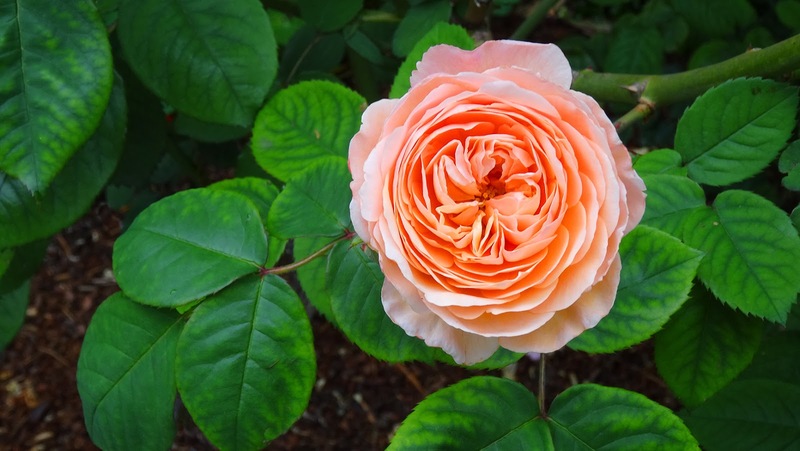 The apricot pink rosettes have a deliciously strong rose fragrance and the medium size blooms with 50-100 petals bloom repeatedly on a medium size bushy plant with medium green coloured foliage. 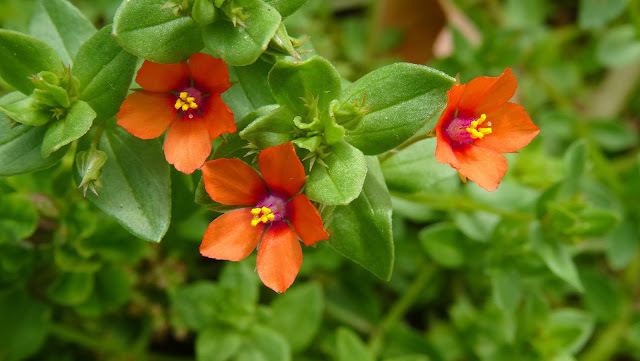 Scarlet pimpernel (Anagallis arvensis), also known as red pimpernel, red chickweed, poorman's barometer, poor man's weather-glass, shepherd's weather glass or shepherd's clock, is a low-growing annual plant. The native range of the species is Europe and Western and North Africa. The species has been distributed widely by humans, either deliberately as an ornamental flower or accidentally. A. arvensis is now naturalised almost worldwide, with a range that encompasses The Americas, Central and East Asia, the Indian Subcontinent, Malaysia, the Pacific Islands, Australasia and Southern Africa. Although traditionally included in the family Primulaceae, the genus Anagallis is now considered to be better placed within the related family Myrsinaceae. In the APG III system, Primulaceae is expanded to include Myrsinaceae, thus Anagallis is in Primulaceae sensu lato.This common European plant is generally considered a weed and is an indicator of light soils. It is most well known for being the emblem of the fictional hero "The Scarlet Pimpernel", a novel written by the Baroness Emma Orczy. Borage (Borago officinalis), also known as a starflower, is an annual herb. It is native to the Mediterranean region and has naturalised in many other locales. It grows satisfactorily in gardens in Australia, remaining in the garden from year to year by self-seeding. The leaves are edible and the plant is grown in gardens for that purpose in some parts of Europe. The plant is also commercially cultivated for borage seed oil extracted from its seeds. 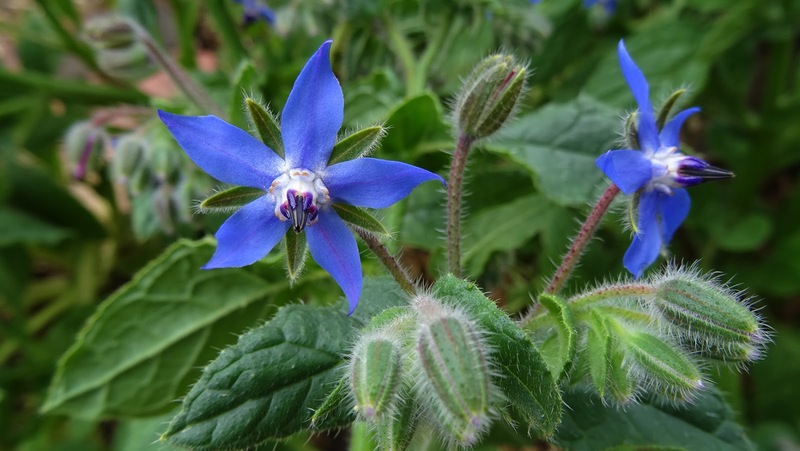 Vegetable use of borage is common in Germany, in the Spanish regions of Aragón and Navarra, in the Greek island of Crete and in the northern Italian region of Liguria. Although often used in soups, one of the better known German borage recipes is the Green Sauce (Grüne Soße) made in Frankfurt. In Italian Liguria, borage is commonly used as a filling of the traditional pasta ravioli and pansoti. The leaves and flowers were originally used in Pimms before being replaced by mint or cucumber peel. It is used to flavour pickled gherkins in Poland. It is also one of the key "botanical" flavourings in Gilpin's Westmorland Extra Dry Gin. In Iran people make tea for the relief of colds, flu, bronchitis, rheumatoid arthritis and kidney inflammations. People with heart problems can benefit using the borage tea in moderate amounts. Gazania is a genus of flowering plants in the family Asteraceae, native to Southern Africa. They produce large, daisy-like composite flowers in brilliant shades of pink, maroon, yellow, orange and cream, over a long period in summer. They are often planted as drought-tolerant groundcover. Most Gazania species and cultivars are low-growing, near-evergreen, clump-forming or carpeting plants. They quickly develop into small clumps of narrow lance-shaped leaves that can be downy and lobed near the base, often with lighter coloured undersides. Their showy flowers, which appear throughout the warmer months, are large, brightly coloured, often interestingly marked, and the ray florets tend to be darker at the base, with a contrastingly coloured central disc. The species usually have yellow or orange flowers, but the garden forms are available in a wide colour range. 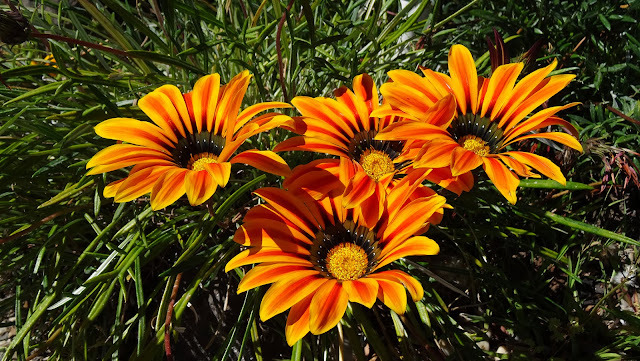 Most gazanias tolerate very little frost and dislike wet winters, but they are otherwise easily grown in any sunny position with light, gritty, well-drained soil. They thrive in coastal gardens. Plants should be deadheaded frequently to encourage flower production. Annuals are propagated from seed; the perennials may also be divided or can be grown from basal cuttings.